I have never foraged for wild mushrooms. I am afraid to. I don't know enough and would probably make a mistake. I would rather cultivate them in my yard from a kit. That way I know for sure which mushrooms I have and that they are safe. I need to acquire a taste for mushrooms. I don't care for them really. Probably not cooked right. I sometimes don't like the texture. They are expensive to buy so it's not worth it to pay so much for something that isn't all that enjoyable. The last time I made soup I threw in some shitake mushrooms. I didn't like them. They were slimy. I admit it. I'm picky. I wonder what kind of soup this was? Trying to imagine shiitake being slimy and failing. 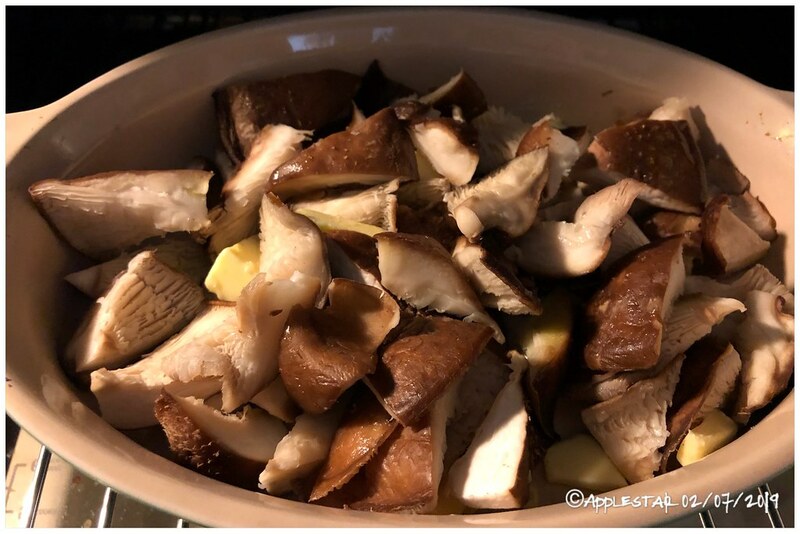 Shiitake has a distinct flavor and aroma, so I tend to cook them into simple, uncomplicated broth if for soup or noodle soup. But IMHO, almost any mushroom is great lightly salted and gently cooked in butter (or good oil ... I guess I use sunflower, safflower, sesame, or EVOO) until they release their moisture and edges are slightly browned/caramelized. applestar wrote: "I wonder what kind of soup this was? Trying to imagine shiitake being slimy and failing." It was just veggie soup, no recipe. The shitakes were just a little bit slimy, not super slimy. And not all of them, just a few. The shitakes were chopped into very small pieces. The soup wasn't ruined. It's just that the shitakes weren't all that fantastic like I was expecting them to be. I need to learn more about mushrooms and how to cook them. I grew up with the standard white mushrooms, crimini I think. No shitake or maitake or portabello etc. Campbell's Cream of Mushroom soup was my most expanded mushroom experience back then. Sometimes we fried crimini mushrooms in butter and soy sauce. That was considered fancy. I didn't even know there was such a thing as shitakes, etc, back then. OK. So it took me this long to move ahead with this project, and I was still unable to get the supplies together and I’m really REALLY out of time. I tend to NOT follow directions, but SOME procedures should really be followed to the letter — I’m afraid my chances of success has significantly diminished. Here’s what I did — this is the bed to the NNE side of the house where the Orchid Fern has established for years. Since the Arrowwood Viburnum and Alternate-leaved Dogwood, as well as Carolina Allspice have grown to mature size, and the big Siberian elm behind the neighbor’s house has grown taller, the area is pretty well protected from direct sun. - put down more sawdust spawn, then covered with brown craft paper and more shavings. 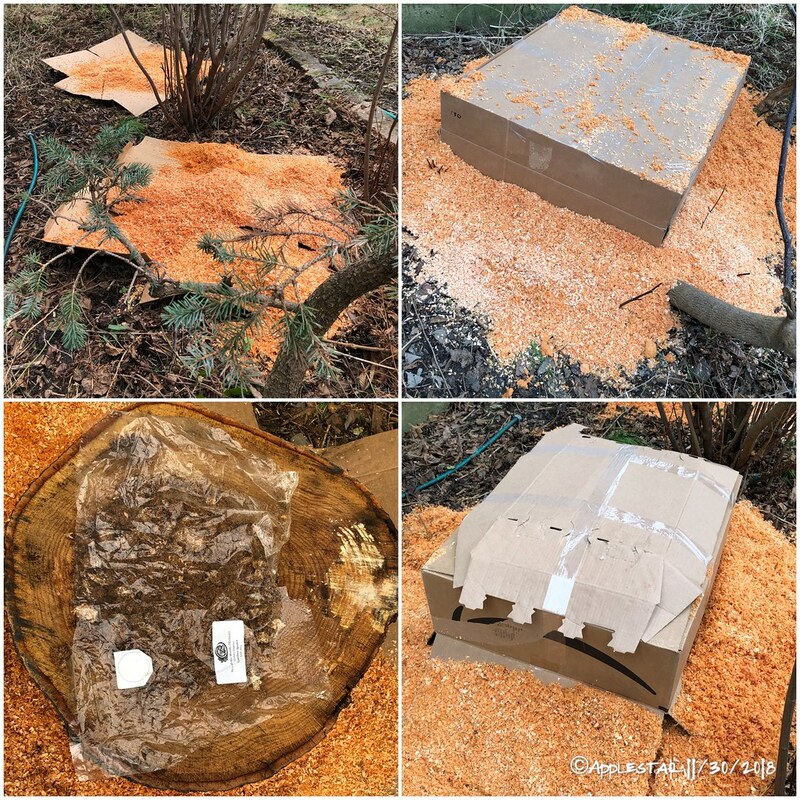 - I loosely covered both with black plastic bag to hold in moisture better, then covered with cardboard box to reduce further contamination and insulate them a little, but with the freezing weather already upon us, I’m not sure how much chance they have of surviving. If the oak rounds are already contaminated by more winter hardy fungi, then the Maitake, which dislikes competition, and even Comb’s Tooth probably won’t be able to colonize due to competition pressure. In the meantime... 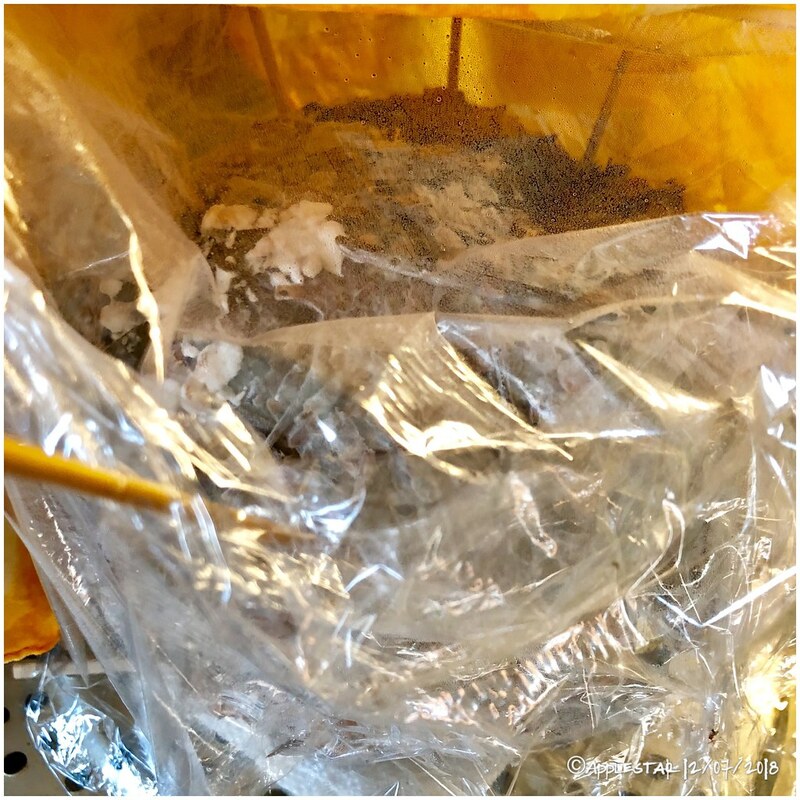 I had a bag of same substrate as the shiitake which I had pressure cooked the next day, then never had the chance to inoculate. 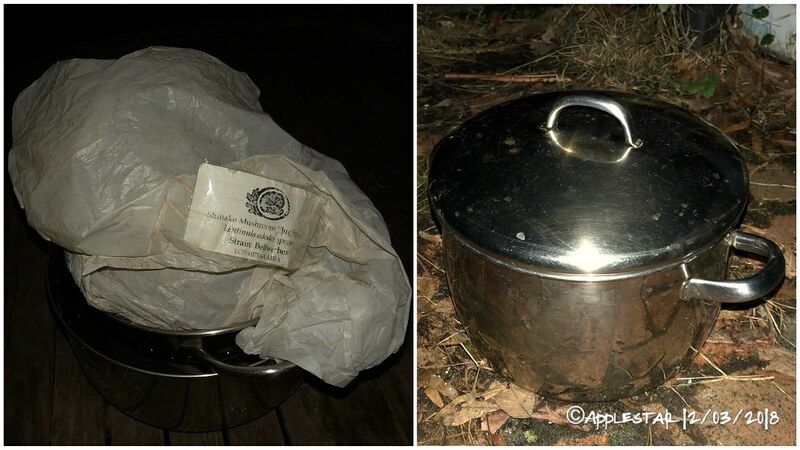 That had been sitting in the pressure cooker on the corner of the stove unopened all this time. 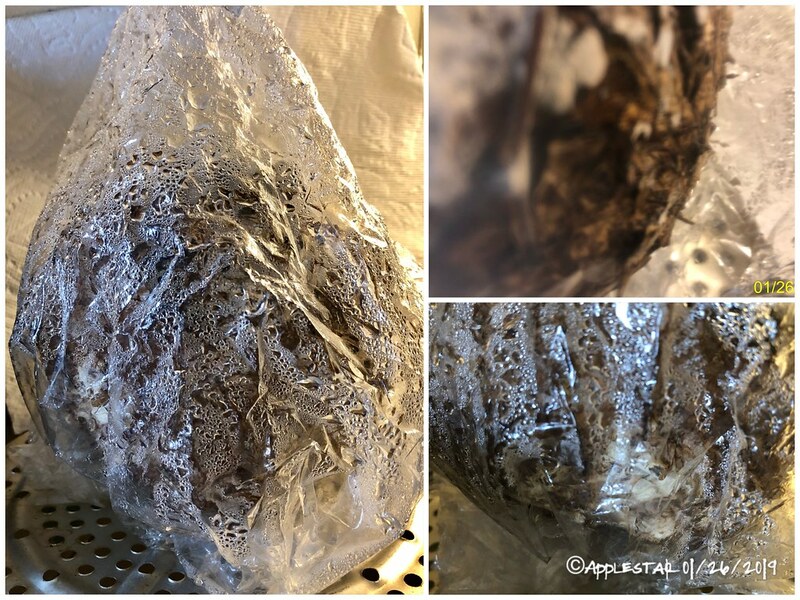 I had intended to re-pressure cook first, but ran out of time and energy, so I simply inoculated it with the Maitake spawn as shown in the top two photos below. I’ll keep that in the same room as the shiitake for now. ...of the 3 jars, the Combs Tooth had become spotty with bits of mold contamination. - I think the leaf/twig substrate was too wet and should have been drained a little better, or better yet, should have been steamed rather than boiled, the combo may have been too rich, or it’s because I hotwater bath’d, but NOT pressure-cooked the jars. I actually emptied one of the jars and mixed it in with the Fir shavings under the Comb’s Tooth round. I misplaced the 2nd jar or I would have done the same. Not sure if that was going to be good or bad... but Comb’s Tooth is said to be pretty competitive so maybe? ...I didn’t get the chance to look at the beech mushroom jar yesterday. 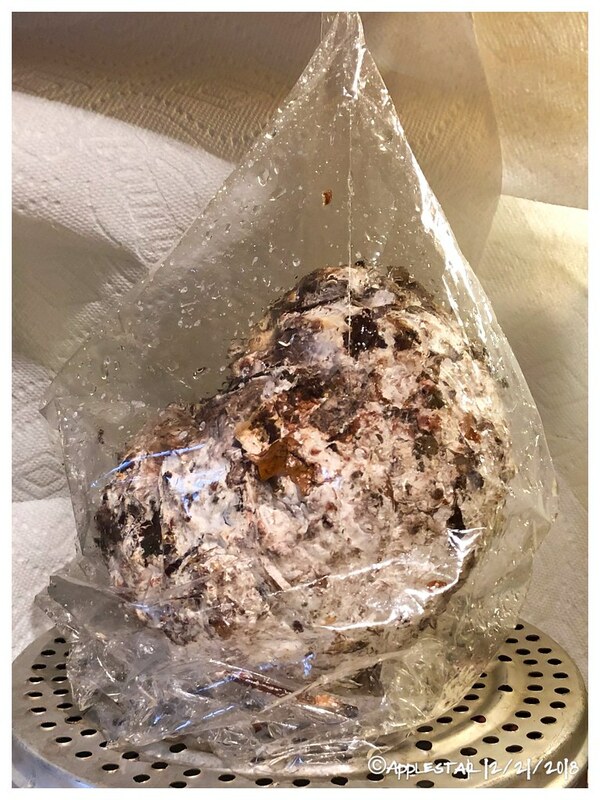 - I put the bag of colonized shiitake substrate outside on the patio overnight (I don’t have room in my fridge for this), and also left out a big pot of boiled water to chill. The temperatures went down to 40’s around 2AM and stayed in the 30’s all morning. 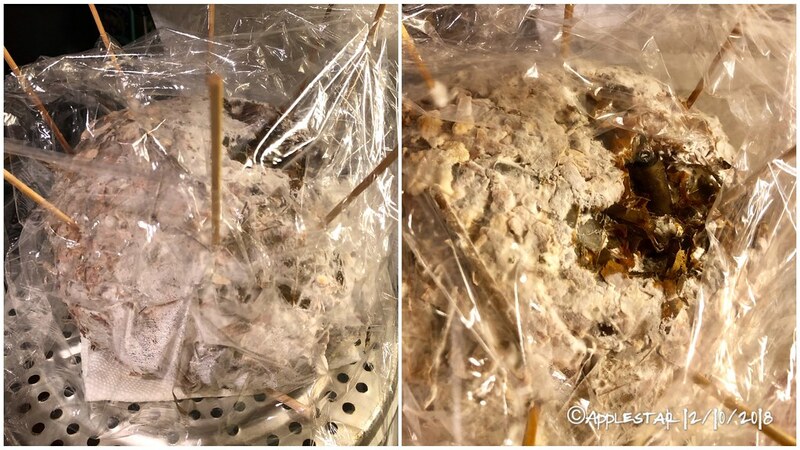 - This morning, I opened the bag, pulled off the worst of the moldy patches, and plopped the shiitake block in the pot of water and left it covered to submerge, then after dunking it a couple of times, brought it inside in a colander to drain, and then set it up on the kitchen counter. - detailing with rum-soaked cotton swabs. - it was even funnier to see that the analogy held, when I had excised all of the affected substrate and found pure white mass “healthy tissue” underneath. I wiped down the counter again, rigged a new humidity cover using the bamboo skewers and some plastic wrap, then covered the top with washed and squeezed damp cloth napkin. I’m planning to “soap-wash the napkin and damp cloth drape” several times during the day to keep up the humidity. 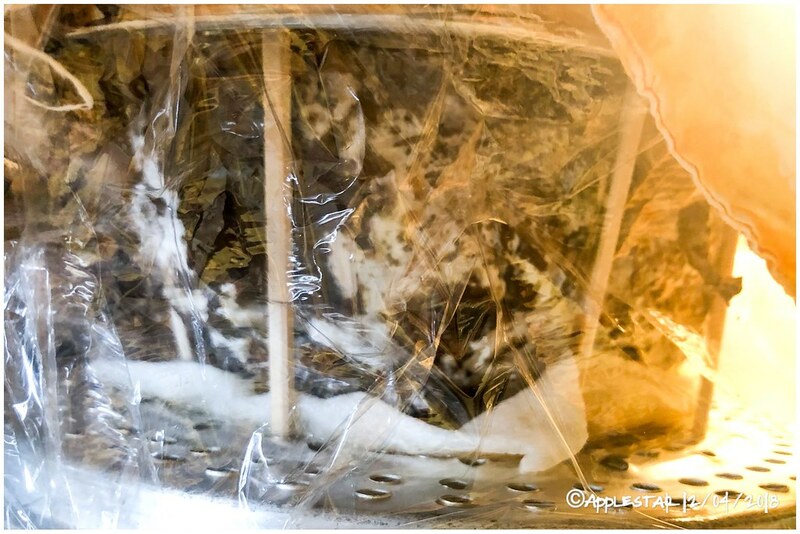 (I can do this at the same time when I’m rinsing the sprouts) — hopefully after this “surgery” and with the more airy new set up, the shiitake mycelia will be able to compete-overtake-colonize the block without further infiltration. I have a better set up going than the last time I grew indoor shiitake, but this weakened block may have a hard time maturing. With the previous indoor shiitake block, I ran into a much worse green mold infiltration when I tried to get the block to fruit for the second time after a full and productive flush. But I’ve learned a few more tricks since then, and I know where I went wrong the last time. Hopefully, this one will fruit for me at least once. 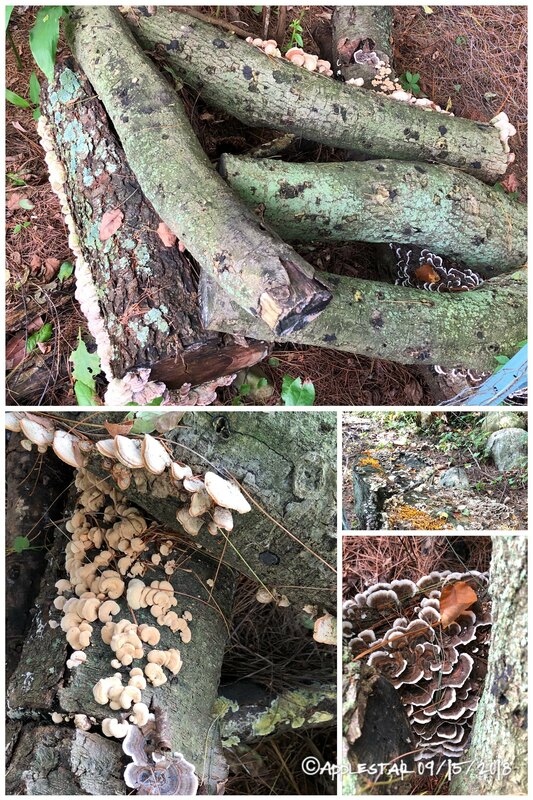 On Sunday — Used about 2 dozen cotton swabs sprayed with rum to clean up scattered blue-green mold that sprang up in surgical site and as tiny patches around lower portions of shiitake block. Replaced condensation-covered plastic wraps. 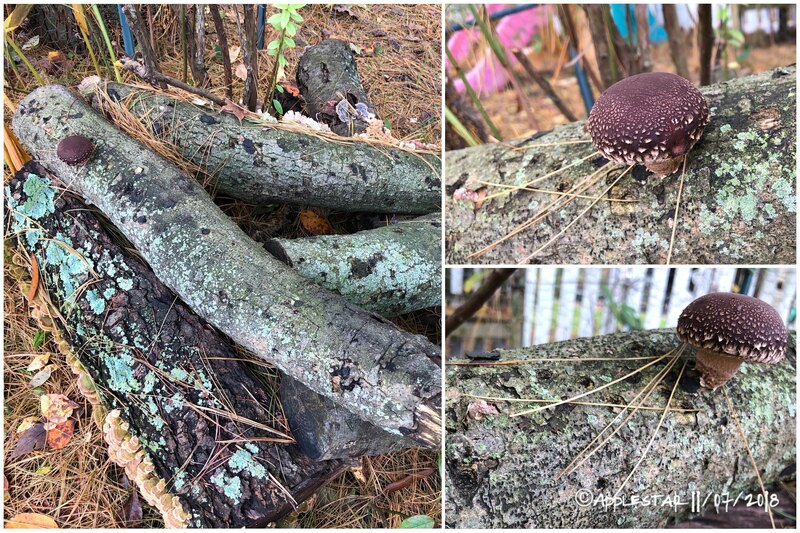 Yesterday when I was cleaning up a few blue-green mold spots and patches, I realized the shiitake block had become too light — it was drying out. So I left it outside in the overnight drizzle — unseasonably warm about 60°F. I loosely closed the bag and put it back on thoroughly cleaned counter and bake/sterilized steamer. For now, I clipped off the top corner of the bag to provide a tiny bit of ventilation while maintaining high humidity for a while longer, but will review what to do from here. 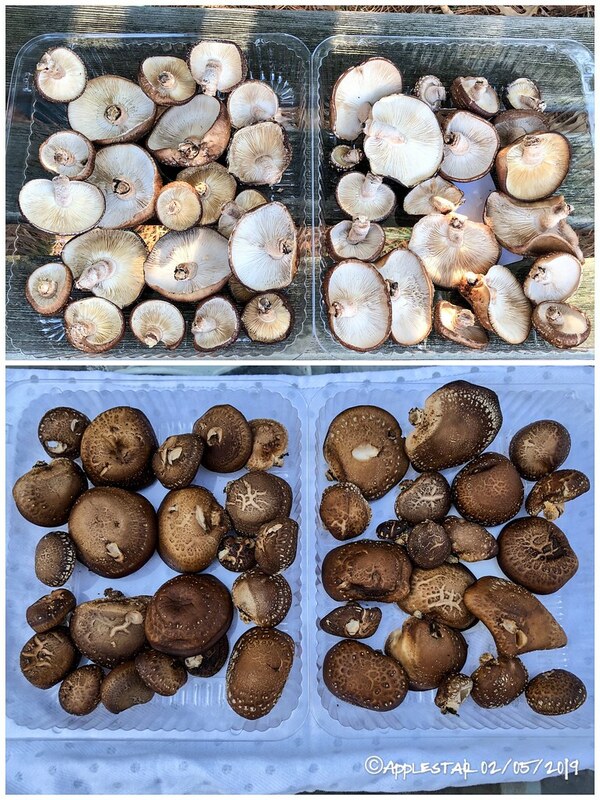 The shiitake mushroom (Lentinus edodes) prefers cool temperatures (45-70 degrees Fahrenheit, 7-21 degrees Celsius), and a high humidity (75-85% relative humidity). It requires light – direct sunlight is too strong, but “skylight”, or light from a fluorescent lamp up to about 15 ft. away, is fine. 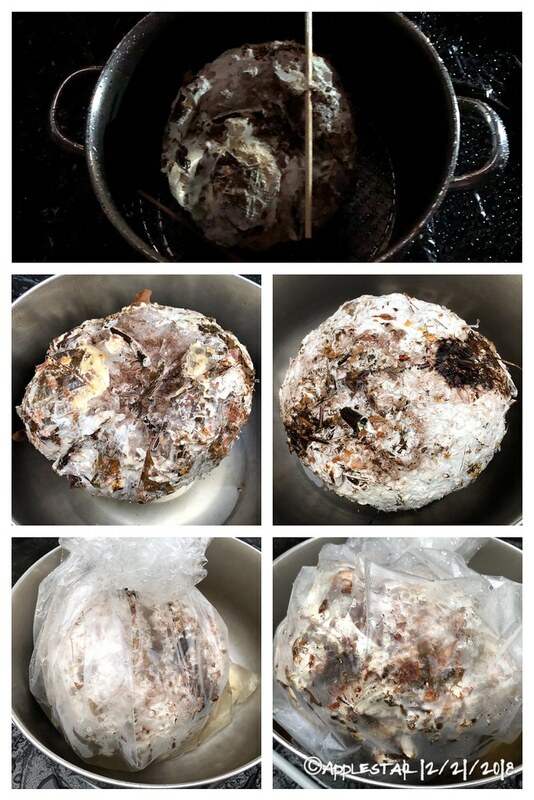 It requires fresh air, but, a lot of air movement will tend to be too drying and may sweep away too much of the carbon dioxide produced by the growing mycelium. In case you are wondering, this hopefully shiitake block is still alive. The white block developed a “bark-like” brown crust over the entire surface, which is what you want, but then it failed to start pinning, so I have tried exposing it to more moisture and chilly temperatures — soaking for 24 hours in the 30’s~40’s°F garage. interestingly, the brown bark-like surface prevented it from soaking up the water, and I found it still bobbed like a cork after the 24 hr soak, even though I submerged it with a weight on top. ...I should probably reassure folks who are trying to decide if this is something they want to try, that when I tried growing an indoor kit purchased from a reputable on-line source that rightly insisted on express shipping — which I think I described in the beginning of this thread or maybe in another thread — the block fruited a full flush in 5 to 6 weeks. This one is an experiment that I grew from substrate on my own, so any number of gardener errors could be present, certainly not optimal conditions by any stretch of the imagination. 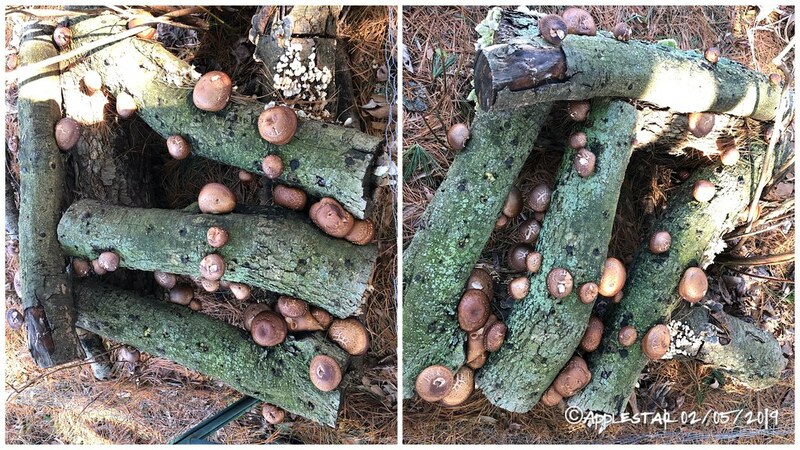 applestar wrote: Unfortunately, it looks like my shiitake logs have been taken over. This is what I found today. ...I’m planning to move these logs and use them for pond-side landscaping. applestar wrote: I’ve mentioned it before — my garden has internet access and secretly monitors what I post about them on-line... then respond to show what they think of my misconceptions. They are particularly impressive when refuting any suggestion that they are “done” or when I post that I have “given up” on them. — and if you look to the left of the beautiful lone shiitake, I think I see another pin forming. Ha! Did I say “impressive”? 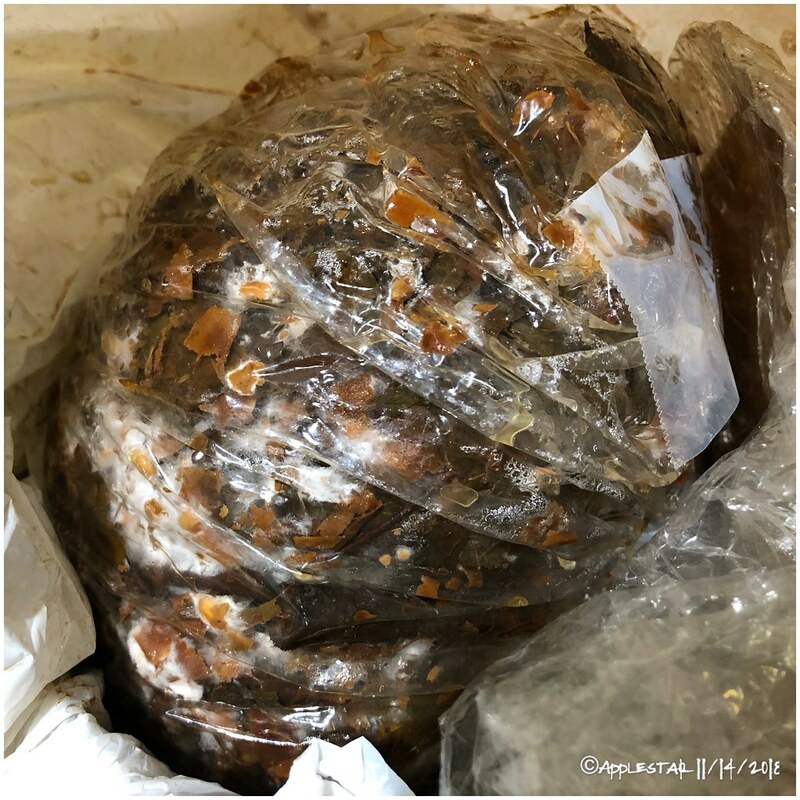 Today, I went outside to take out grocery bags of kitchen scraps for the compost pile (it’s winter and they are slow to decompose even just inside the back door, especially when the temperature outside had been dipping down to negative single digits). It’s ridiculously warm today — 65°F — and I decided to take a stroll around the garden, just to look around, you know? Quick! Go back in the house for the cell phone and something to harvest them in! Biggest ones are about 3 inches in diameter. Some had been drying up — freeze drying more likely — most had been growing for a while. There were only 2 or 3 that had the freshest creamy-white gills. But none of them smell bad or even have a noticeable smell, so to me, this means they are all OK to eat after brushing off. Some will be cooked fresh but most will be dehydrated since this is a big harvest. Ones with holes that are suspect are normally soaked in salt water first, but I doubt anything would be alive after the severe cold temperatures we just experienced. 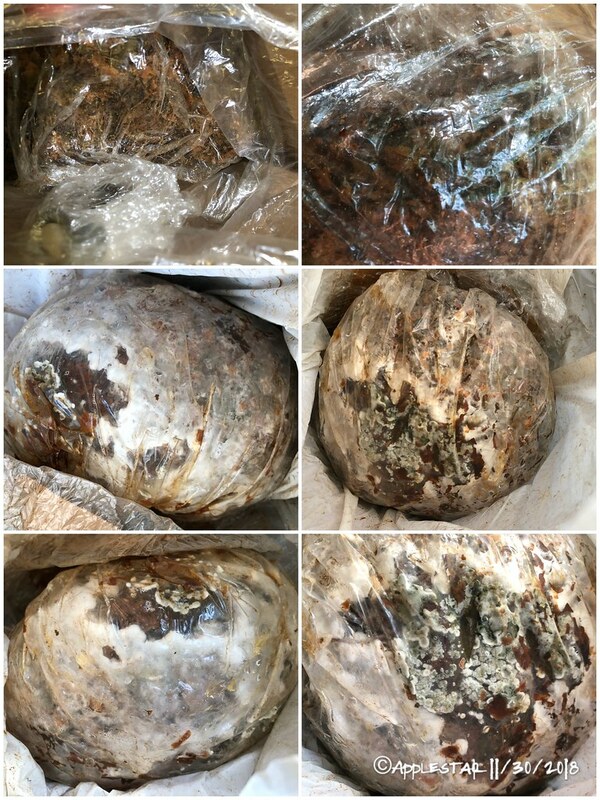 Where can you get mushroom manure?